Poor dietary meals and activities are probably the main causes that result in fatty bellies. High intake of food that contains so too cholesterol results in the accumulation of fats in the stomach tissues which eventually leads to obesity. A recent survey revealed that 67% of males and 57% of ladies in the UK are suffering from obesity. Likewise in the US, an estimated 50% of adults are undergoing the same problem. 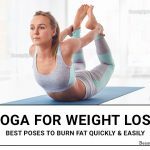 However, yoga poses can be a one-time solution for this problem because it effectively burns the excess, therefore, leading to the growth of stronger Abs around the abdominal regions. Awareness programs need to be organized consistently to educate these individuals about the importance of yoga, especially for their Abs. 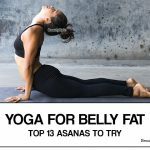 This article highlights the best top 10 yoga poses for Abs. Lunge twist is a challenging and technical balance yoga pose for Abs which develops the perfect stability for the whole body. Lunge with your left foot forward and place your hands at the canter of the chest with the palms joined together. Let the right leg remain straight before starting to bend towards the lunged foot. Ensure the thigh and the lunged leg are at 90then tighten your Abs while twisting the body towards the left foot with the faced pointing upwards. How it Benefits: Lunge twist stabilizes the abdomen muscles. It hardens the Abs leaving them with an appealing posture. It is also a challenging yoga pose for body balancing which operates on the sitting core. Sit on a level flat surface with your legs closely joined to each other. Start by lifting the joined legs slowly while moving your chest towards the straight positioned legs and the hands holding the stomach. Bend until you form a V-shaped figure then maintain this position for some time until you feel the Abs burning. How it Benefits: Boat pose specifically creates the core strength by engaging it in endurance activities. It’s an isometric movement yoga pose for in-depth contractions and expansion of the Abs. Performing several moves will leave you smiling. It requires stabilization from the abdomen. Lie on your right side on either an inclined or a flat surface. Cover the right leg with the left one and let the left arm lie on them. Start lifting your body using the right arm with the palm facing downwards for newbies. Otherwise, you can choose to lift it with the figure tips. Straight the supporting arm until it perpendicular to the body and rest while at this position. 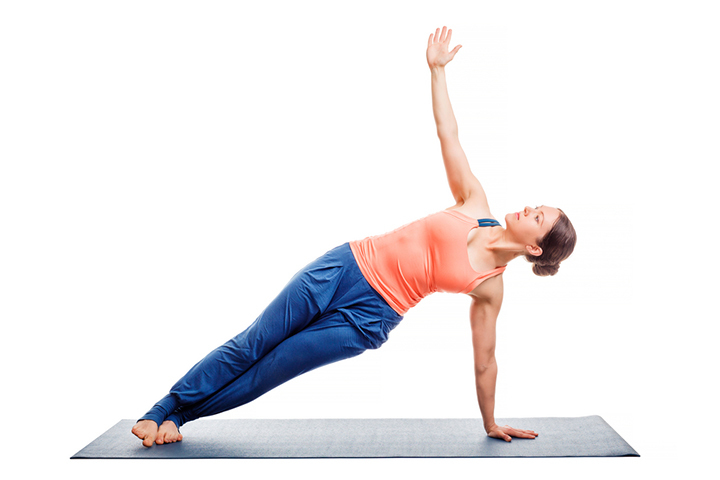 How it Benefits: Side plank plays a major role in toning the Abs. It stimulates the waist and strengthens the abdomen. It’s an intermediate yoga pose for hardening the Abs and back-bending which uses the abdomen it’s central base. It’s not suitable for pregnant ladies or individuals who are recovering from surgery. Lie on your stomach and spread out your arms. Inhale deeply and begin turning your arms, back-head and shoulders upwards and backwards. At the same time continue lifting your legs upwards but towards and past the hips until they meet with the hands. How it Benefits: Now pose enhances blood flow throughout the body. It tightens and stretches the abdominal muscles thereby making the Abs tight. 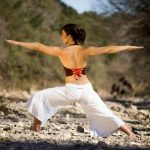 It is a general workout yoga pose that more important when it is undertaken for a longer period and involves various vacations in the downward facing style. Kneel down and spread your hands to touch the floor and take a deep breath. Start lifting your hips upwards while at the same time moving your legs towards the hands. Ensure your face is pointing down then try lifting one of your legs upwards until it is on level wiht the hips and maintain that position for some minutes before turning to the other leg. How it Benefits: Dolphins pose is essential for conditioning the core and making the Abs flexible. Downward dog pose. It is a strengthening and balancing yoga pose that is quite easy. It is a strengthening and balancing yoga pose that is quite easy. Position yourself well while standing on a level floor and breath in and out deeply. Bend down slowly and touch the floor with both palms while they are slightly distanced. Open the legs slightly and start moving than backwards away from the abdomen. Move the arms away from the shoulders and hold your breath for some seconds. How it Benefits: Continuous exercising helps in flattening the belly which exposes the Abs. It also makes the arms stronger. It is simultaneous shoulders and abdomen strengthening yoga pose. Sit on a level base with both the fingers and the face pointing towards the feet. Take a quick deep breath and start lifting your body upwards with the chest leading. The feet should hold on to the floor and the face-up. How it Benefits: It strengthens the abdominal spinal muscles due as a result of stretching. Bridge pose is one of the back-bending yoga poses that involves a variety of poses that stimulate the body. Simply lie on your back and move the legs close. Raise your waist and ensure the feet are on the floor. Push your chest and abdomen upwards with the head and hands on the ground. How it Benefits: It stretches the back muscles, therefore, energizing them. Blood flow in the body also increases. Fish pose is a counter yoga pose specifically for the shoulder stand. Lie on a soft but firm surface on your back with the hands-on lying in the sides. Hold on to the ground with the palms positioned slightly under the back with legs lying straight on the surface. Then move chest upwards while supporting them with the elbows. Inhale deeply and maintain your chest at that position before falling back. How it Benefits: Fish pose strengthens the neck muscles therefore boosting their flexibility. It is a muscle builder pose for the arms and legs that need great stability and balance. All the body muscles are usually engaged during the process which is significantly important. While standing, move down until the thighs are parallel to the floor. Push your hips back and down until you attain a string posture while the hands are vertically raised. How it Benefits: It builds the general body stamina. Apparently, it’s advisable to visit yoga classes before trying out the poses since you will be informed in detail on how to handle them. In fact, yoga should the number one doctor’s recommendation for building abs and treating obesity.